The Israel Dog Unit (IDU) is urging Jews throughout Judea and Samaria as well as local emergency response teams to join the canine defense program so as to prevent terrorist infiltrations into Jewish towns in Judea and Samaria. The IDU provides protection dogs and courses to Jews who seek to protect their families and towns using specially trained defense dogs. The IDU operates a separate division that looks for missing people with specially trained search-and-rescue dogs. In March, a Muslim infiltrated the Mor Farm located in the Mount Hebron region. Shabtai Kushelevski saw the terrorist outside his home, and ran inside to get his gun. The terrorist followed Shabtai into the home, where his wife was nursing their young baby in a side room. When Sayad Machmud Ali Kaysiya tried to stab Shabtai in the back, he was attacked by Sofie the family dog, allowing Shabtai time to grab his gun and shoot the terrorist dead. Two knives were subsequently found on the terrorist. 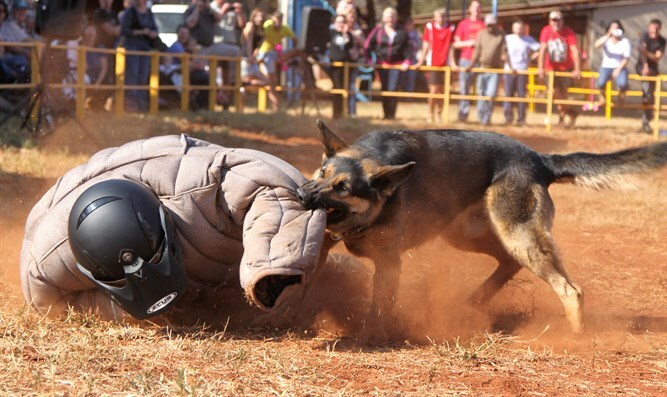 The Israel Dog Unit is inviting residents of Judea and Samaria as well as security personnel to attend a training session and demonstration to show how dogs can be employed to prevent terrorist attacks at Chavat HaKlavim, the IDU branch in Efrat at 1.00 PM, today (Sunday) at 1.00 PM.